Someday I came over the Desiderata and liked it at first sight. It became a guideline to my life as may have happened to many other people. 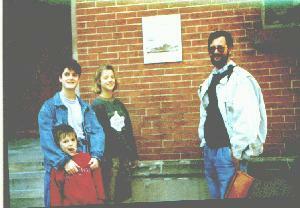 So, years later when I planned a trip through the East of the USA it was a must to visit Saint Paul´s Church, Baltimore. I hoped to find something spectacular there, so I was very dissapointed when the church was closed on our arrival. I put a letter into the mailbox and left. Returned to New York a week later I found a letter from the parish that gave me the Info I´m passing to you below. 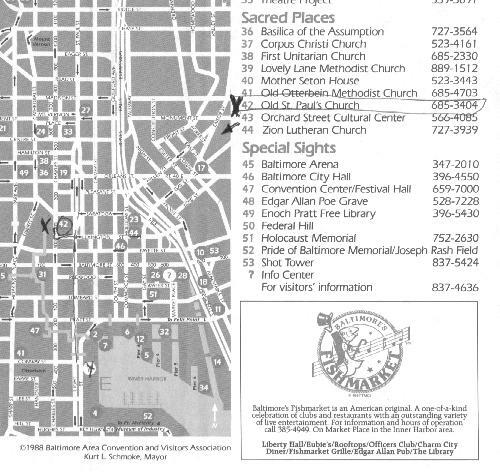 If you have an opportunity to visit Baltimore - have a look at the church and enjoy the near inner harbour sightseeing. LINKS: A lot of the links I used to visit disappeared over the years (2016). So I gave up publishing any by myself. I'd like to mention the website of Marilee Schurke/Macler, she found a lot of Desiderata versions. Many links are not valid anymore, some were even taken over by spammers, so she gave it up. Google still has a lot of links to find. A Poem found in Old St. Paul´s Church in Baltimore has become a familiar and inspiring credo displayed throughout the English speaking world, and day by day its popularity grows. The poem is "Desiderata," which translates from the latin to "Things to be desired." Almost every reproduction of the message carries the identifying line: "FOUND IN OLD SAINT PAUL´S CHURCH, BALTIMORE. DATED 1692." Because of this, the poem is being referred to more and more as "The Baltimore Prayer." Poster companies print the credo in many shapes and sizes, with a wide variety of illustrations and typography. Columnists in numerous papers have printed it. One syndicated writer whose readers are principally teenagers devoted a column to it as a shining beacon for her readers. It has been read out on radio and television programs, printed on christmas cards, reproduced in house organs and included in anthologies. "Desiderata" seems to appeal to all people. Framed copies hang in the studies of ministers and college professors, in waiting rooms and in the offices of business executives. It is also a best seller in the Haight-Ashbury area of San Francisco, where the hippies buy it printed on imitation parchment and tack it up unframed. A Baltimore bookstore at Park avenue and Mulberry street carries reproductions in two different sizes and styles, printed by two different poster companies. Following the death of Adlai Stevenson in 1965, a book found on his bedside table was opened to the poem, which bore the familiar St. Paul´s, Baltimore, credit line. Questioning the ambassador´s secretarial staff, reporters learned, he had been fond of the inspirational message and had planned to use it on his Christmas cards. Friends later had the cards printed, and distributed them as Stevenson mementos. Questions about it began cropping up. The words had a familiar ring to many, but they escaped immediate identification. A Baltimore authority on early English literature said, "This work, as it reads now, was not written in 1692. The words are not those of the Seventeenth Century, nor is it the composition." In its January, 1966, issue, Together, a national United Methodist magazine, featured on its cover a reproduction of "Desiderata" inscribed on parchment with the credit "FOUND IN OLD SAINT PAUL´S ANGLICAN CHURCH, BALTIMORE. DATED 1692." Later the editor described the mail response as "an explosion of letters." Literary detectives went to work on "Desiderata," and soon its true story was slowly revealed. It was written in 1927 by Max Ehrmann, a Terre Haute, Ind., poet, author and lawyer. Mr. Ehrmann, who was born in 1872, entered Harvard´s School of Philosophy at the age of 22. He studied philosophy and law, spent ten years writing six books and finally, when he realized he could not make a living as a writer, began practicing law. Later he became deputy prosecuting attorney in Terre Haute. He died in 1945. Three years later his widow included "Desiderata" in "The poems of Max Ehrmann," published in 1948 by the Bruce Humphries Publishing Company, of Boston, which is still publishing it in a $ 4.50 edition. With the poem´s age and authorship established, questions still remained. Why the 1692 date, and why the St. Paul´s, Baltimore, credit line? The Rev. 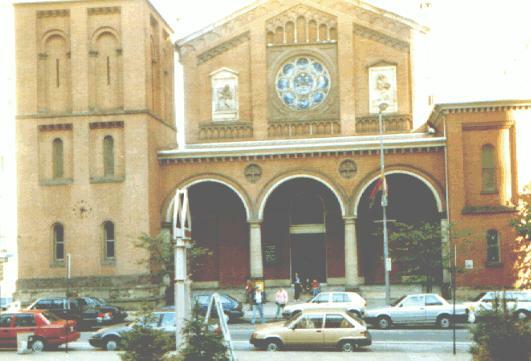 Halsey Cook, rector of Old St.Paul´s, told inquirers that no literary work of any kind could have possibly have been found in St. Paul´s Church in Baltimore in 1692, because the church did not then exist. St. Paul´s parish was established in 1692, but its first crude log church was not erected until the following year. Another letter from a reader of Together gave more information. Mrs. Florimonde Reed, of Baltimore, wrote to say "Desiderata" appeared in "Between Dawn and Dark," a booklet compiled by the Rev. Frederick Ward Kates, who had been rector of Old St. Paul´s from 1956 to 1961. In this, the poem was credited to Max Ehrmann. Mr. Kates, who had become rector of St. Luke´s Church in Dallas, told the rest of the story. Mr. Kates, a former newspaper man, enjoyed collecting and anthologizing inspirational essays, poems and quotations. From time to time, especially during Lent, he used them in mimeographed booklets, which he scattered about the church for parishioners to take home. Immediately, he recalled having used "Desiderata" in such a booklet, probably in 1956, although a copy of it cannot now be found. Apperently the credo was used on the front page of the booklet, for the mimeographed editions always carried on their covers the name of the church and the date the parish was founded, "OLD SAINT PAUL´S CHURCH, BALTIMORE. 1692." The rest of the story is conjecture, but it is strong conjecture. A parishioner must have carried a booklet from the church in his pocket and later felt impressed enough by "Desiderata" to have it reproduced. And in its first reproduction, the printer gave it the misleading credit line. It would seem apparent that almost all subsequent reproductions have stemmed from that first copying, for almost all of them perpetrate the error of the credit line. Staff members at Old St. Paul´s recall that early queries on the poem came from England, and later from New Zealand and Australia, and subsequently from each of the United States. An averadge of half a dozen queries continue to come in every week. To answer these the church sends a form letter giving the basic facts about "Desiderata," where the inquirer must write for copyright permission, and concluding, "The date of 1692 refers to the founding of St.Paul´s Parish. It is in no way connected with the poem." Enjoy your achievments as well as your plans. Keep interested in your own career, however humble. It is a real possession in the changing fortunes of time. Exercise caution in your business affairs; for the world is full of trickery. But let this not blind you to what virtue there is; many persons strive for high ideals; and life everywhere is full of heroism. Be yourself. Especially, do not feign affection. Neither be cynical about love; for in the face of all aridity and disenchantment, it is perennial as the grass. Take kindly the counsel of the years, gracefully surrendering the things of youth. Nurture strength of spirit, to shield you in sudden misfortune. But do not distress yourself with dark imaginings. Many fears are born of fatigue and loneliness. Beyond a wholsome discipline, be gentle with yourself. You are a child of the universe, no less then the trees and the stars. You have a right to be here. And wether or not it is clear to you, no doubt the universe is unfolding as it should. Therefore, be at peace with God, whatever you may conceive Him to be. And whatever your labors and aspirations, in the noisy confusion of life, keep peace in your soul. With all it's sham, drudgery and broken dreams, it is still a beautifull world.